An awesome friend, a beautiful hot day approaching sunset and a celebrity chef restaurant. This is my Saturday. How gorgeous. It has been a fantastic week of catch-ups, dinners and drinks. I only have 2 weeks before I fly to London and start the next chapter of my life. I cannot begin to tell you how excited I am. Putting the excitement aside for a second, I cannot allow the next 2 weeks to pass me by. In true Singaporean style, I am thinking of my tummy (Singaporeans just love their food!). I am a foodie, I scour cook books, I am addicted to MasterChef Australia/US/UK and I love following (note not stalking!) some celebrity chefs on social media to see what’s coming next and what inspires them. My Singapore Bucket List has been growing with the addition of many restaurants however there are also a few places I’m revisiting because I know I will miss them. One of which is Salt tapas & bar, by Luke Mangan. 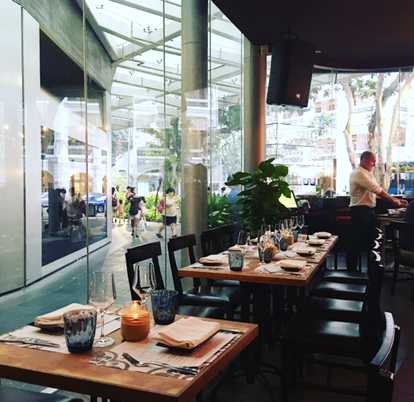 Salt tapas & bar is located at North Bridge Road, Raffles City. It neatly and proudly sits opposite the iconic Raffles Hotel. It is open aired with the interior boasting a warm, friendly and welcoming feel, encapsulated by authentic spanish tiles and there is something about burnt sienna brick walls in a restaurant which engulf me with comfort. The menu here is generous, it’s difficult to decide but first things first. I need a cocktail! After researching (I am a terrible, no rephrase, I am an awesome information junkie! ), I discovered that Luke has a signature cocktail called The Australian. And you know what, that divine cranberry coloured liquid, is just Christmas in a cocktail. I was immediately transported to festive heaven with log fires and carol singing! The staff are awesome, they are gracefully present and appropriately attentive. The Head Chef, Jake Kowalewski is from Sydney and has lived in Singapore for just over a year. He was previously Sous Chef at Luke’s other Singapore restaurant Salt grill & Sky bar and moved across to Salt tapas & bar as Head Chef, 2 months ago. He has since changed 19 dishes on the menu and is loving every minute of working there. We ordered a myriad of dishes and being a total truffle fries addict, they were obviously top choice. I have been on a mission to find the best truffle fries in Singapore…I think I just found them! If you have never tried them, they are French fries tossed with truffle oil, truffle salt and parmesan cheese. You either love them or you hate them. PS) Did you know Liquorice is originally dark green?! And when infused with milk it transforms into the gorgeous light green colour below! Thanks Jake for the info! My personal thanks in abundance, to both Luke Mangan and Jake for an awesome experience and for looking after us, we loved it! Please open a restaurant in London and New York for me….